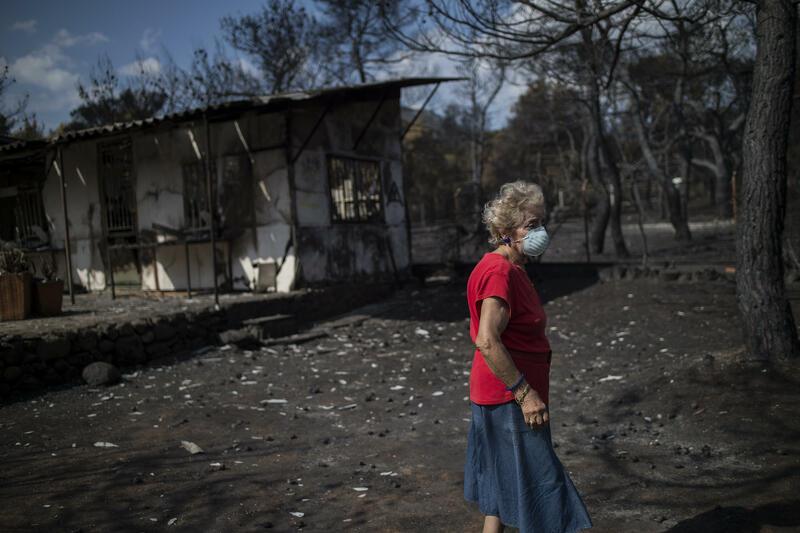 ATHENS, Greece -- Frantic relatives searching for loved ones missing in Greece's deadliest forest fire in decades headed to Athens' morgue Thursday, as rescue crews and volunteers continued searches on land and at sea for potential further victims. Those arriving at the morgue were being informed of the necessary steps to match the missing and the dead, including providing DNA samples and dental records. The fire northeast of Athens in the area of Rafina, a seaside resort of permanent residences and holiday homes popular with Athenians and tourists, broke out Monday and raced through the area, fanned by gale-force winds. The fire department said Thursday the death toll had increased by one to 82. Spokeswoman Stavroula Malliri said the search for further potential victims continued, So far, she said homes in the area that had not been destroyed and were shut had not been entered by rescue crews, but that the search would not end until every building in the area had been thoroughly investigated. Apart from the house-to-house searches in the burnt areas, coast guard and volunteer divers were also searching the waters off the coast of the worst affected areas and a nearby deserted island. During the fire on Monday, hundreds fled to nearby beaches, with many swimming out to sea to escape the ferocious flames and choking smoke. Dozens spent hours at sea before being picked up by coast guard vessels, fishing boats and a passing ferry. Several of the dead were people who drowned. Most of the bodies have been burnt beyond recognition, meaning identification was possible only through DNA and dental records. Maria Saridou arrived at the morgue in the Greek capital accompanied by her son to provide DNA samples. They were looking for Saridou's 55-year-old sister, Eleni, who had gone swimming with a friend of hers in Mati. The friend her sister had gone swimming with survived with light burns to the foot, Saridou said, but they became separated in the chaos of the fire. "We just want to find her," said Saridou's 25-year-old son Asot Kostoyan. "Just to find her, nothing else." Hundreds of homes were burnt in the blaze. The speed with which the flames spread took many by surprise. The narrow streets of Mati, an area built up with no town planning, quickly became clogged with parked and abandoned cars as people tried to flee, hampering access by firefighting trucks and blocking escape routes. Some of the dead are believed to have tried to make it to the shore through narrow pathways, but lost their way in the thick smoke or had their paths blocked by the swift-moving blaze. Even those on beaches were not safe, as flames burned trees and vegetation at the water's edge, while flaming pine cones rained downward, survivors have said. Recriminations about the apparent lack of an evacuation plan and what many perceived to have been a slow response have mounted, with survivors saying they had been abandoned to do whatever they could to save themselves alone. But survivors have accused authorities of failing to adequately prepare and for not giving an evacuation order soon enough, as well as not responding fast enough.